Today I can publish the third paper in our series, on the Manner of Receiving Communion, about receiving communion directly in the mouth, as opposed to in the hand. The PDF is on the FIUV website. because the arguments are objectively valid and have an universal dimension. The Position papers are not directly concerned with the Novus Ordo, but I hope they may be a contribution to the wider debate going on about liturgy in the Church. The next paper will be about Liturgical Orientation (ie celebrating Mass ad orientem or versus populum), which I'll publish in two weeks' time. Full set of papers, including the introductor disclaimer, can be downloaded from the FIUV website. 11. 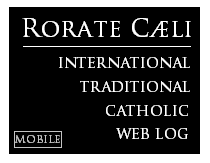 As with the issue of service at the altar by men and boys, the question of the manner of receiving Communion at celebrations of the Extraordinary Form of the Roman Rite is settled by the Instruction Universae Ecclesiae (2011), which upholds the bindingness, in celebrations of the Extraordinary Form, of the liturgical law in force in 1962. This specifies that Holy Communion is to be received by the Faithful kneeling and on the tongue. 22. Whereas service at the altar by females has been permitted in the Ordinary Form at the discretion of the local Ordinary, the prohibition on the reception of Holy Communion by the Faithful in the hand was expressly reiterated by Pope Paul VI, who merely noted that applications for a derogation of the law would need to be made by an Episcopal Conference to the Holy See. To explain the value of this practice, as this paper seeks to do, is to explain the value of the Church’s own legislation. It may well be that kneeling is alien to modern culture—insofar as it is a culture, for this culture has turned away from the faith and no longer knows the One before whom kneeling is the right, indeed the intrinsically necessary gesture. The man who learns to believe learns also to kneel, and a faith or a liturgy no longer familiar with kneeling would be sick at the core. Where it has been lost, kneeling must be rediscovered, so that, in our prayer, we remain in fellowship with the apostles and martyrs, in fellowship with the whole cosmos, indeed in union with Jesus Christ Himself. 44. It remains to observe that the moment of one’s reception of the Body of Our Blessed Lord in the Blessed Sacrament is an appropriate moment to kneel, and doing so is a very longstanding tradition in the West. Blessed Pope John Paul II reminds us that the proper attitude in receiving Holy Communion is ‘the humility of the Centurion in the Gospel’: this attitude is both manifested and nurtured by the recognised posture of humility, of kneeling. The requirement, in the current discipline of the Church, that a ‘gesture of reverence’ be made before Holy Communion is received, is fulfilled in a most natural and unforced manner by receiving while kneeling. In view of the state of the Church as a whole today, this manner of distributing Holy Communion must be observed, not only because it rests upon a tradition of many centuries but especially because it is a sign of the reverence of the faithful toward the Eucharist. The practice in no way detracts from the personal dignity of those who approach this great Sacrament and it is a part of the preparation needed for the most fruitful reception of the Lord’s body. 99. Insofar as we see this traditional method as having developed over time, this is not an argument against it but a testimony to the important considerations which consistently led to its adoption. As Pope Pius XII famously affirmed in Mediator Dei (1948), more ancient practices are not ipso facto to be preferred to practices which have evolved under the guidance of the Holy Spirit over many centuries. to increase among the faithful devotion to the Real Presence of Christ in the Sacrament of the Eucharist. Further, the traditional method is called an ‘external sign’ to ‘promote understanding of this great sacramental mystery’. Even if this excludes enhancing the value of other criteria, also legitimate, and implies renouncing some convenience, a change of the traditional usage risks incurring a non-organic intrusion with respect to the spiritual framework to which it refers. Luke 22.41 (during the Agony in the Garden of Gethsemane). Pope Benedict XVI op. cit. p194. In the West, the development of kneeling for Communion can be traced back at least to the 6th Century: see Athanasius Schneider ‘Dominus Est’ (Pine Beach NJ: Neman House Press, 2008) p27. St Ephrem the Syriac Sermones in Hebdomeda Sancta 4, 5: ‘Isaiah saw Me [sc. Christ], as you see Me now extending My right hand and carrying to your mouths the living Bread.’ The reference is to Isaiah’s vision of the live coal with which the angel touched his lips (Isaiah 6.6-7). [Footnote 6 in Memoriale Domini (MD)] Cf. Augustine, Enarrationes in Psalmos, 98, 9: PL 37, 1264-1265. [Footnote 7 in MD] Cf. Justin, Apologia I, 66: PG 6, 427; cf. Irenaeus, Adversus Haereses, 1.4, c. 18. n. 5: PG 7,1028-1029. [Footnote 9 in MD] Cf. ibid. n. 9, p. 547. [Footnote 10 in MD] Cyril of Jerusalem, Catecheses Mystagogicae, V. 21: PG 33, 1126. Office for the Liturgical Celebrations of the Supreme Pontiff: ‘Communion received on the tongue while kneeling’ (2010). ...and yet, and yet; after all those magnificent words from those in authority in the Church. the final conclusion cannot be drawn; Holy Communion in the hand must be suppressed. It is the nexus point liturgically of the attack on the Faith. The monstrous distortions of what the Blessed Eucharist is, the equivocations on what the Mass is and is not comes from nearly the highest levels in the Church. An example can be seen in documents produced under the auspices of various members of the Canadian hierarchy that equivocate, obfuscate the Sacrificial nature of the Mass. Contained within is the centrality that communion is received on the hand... I am personally convinced that until this abominable practice goes there will be no change in the Church. Out of all of the modernist and relativist abominations that came into Christ's Catholic Church during and after the Second Vatican Council Communion in the hand, standing while receiving Communion and Lay Eucharistic "ministers" are definitely the worst in my opinion. "Amen" Francis. Again, I say "Amen". The recent abominable treatment of Fr. Guarizzo - I do hope I have spelt his name correctly fro memory - is an example of this equivocation and down-playing of the Real Presence. If I was a priest in a church, or a Bishop, or Archbishop, or higher, I would rather risk my elevation through the hierarchy than see anyone and I literally mean anyone receiving Our LORD in their 'hands'. This is one of many things that I would enforce strictly (kneeling as opposed to standing, no EMs as opposed to some, and no laity unless serving or having express permission allowed inside the sanctuary).Alongside this, I would provide special catechism as to why this is the case. It is wonderful to kneel at the rail to receive communion. It is a bit like receiving nourishment from Heaven. The problem is, that in the Novus Ordo there are many Eucharistic ministers, mostly women. The value of receiving on the tongue then is minimal. One can change lines to receive from the priest, but if that became generalized they would leave the priest holding the chalice. Best solution at present is to deeply bow while the person in front is receiving the host and then receive on the tongue while standing. Unfortunately kneeling is not allowed at present. 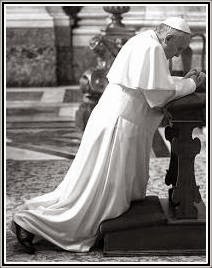 With the personal example of the Holy Father perhaps the bishops might be shamed into allowing communion while kneeling, but it has not happened yet. So the solution is to attend the Latin Mass even if it involves a driving far away, as is the reality for so many. The Una Voce position papers are a very useful reference source. Heilige Vater, vielen Dank für Summorum Pontificum. One may not be refused the Eucharist because one kneels to receive - anywhere. 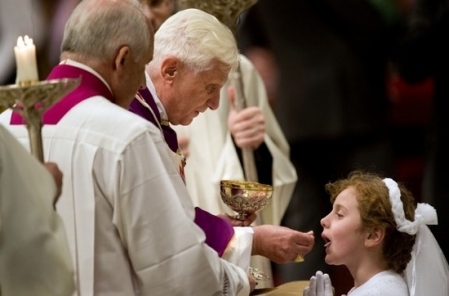 It is crucially important that the Church returns to the practise of receiving Communion by mouth. The “Relativist” Reformers, after Vatican II, used reception in the hand as their main tactic in attacking the concept of the Real Presence. They understood its symbolic effectiveness. The rest of us forgot! It is up to all bishops and priests, and laity, to do what they can to restore this ancient custom as the norm in our parishes. "Unfortunately kneeling is not allowed at present." You are misinformed. Of course it's allowed, Gratias. But most people don't do it because: 1.) They've lost the faith; 2. )Their faith is weak; 3.) They are afraid; 4.) They are misinformed. We may defend and applaud the Fr. Guarnizo's, but until the laity is also willing to take the risk of being shamed or persecuted for rendering our Eucharist Lord proper homage, we are nothing but windbags. Furthermore, the example by our Holy Father is presented as only an option. That is a problem. Did anyone notice that President Calderon refused to use the kneeler in front of him? He did only a little better than Queen Sofia by at least receiving on the tongue. The faithful should not take any risk of being "humiliated". Just go to the Traditional Mass. Please do not misunderstand me, NC. I don't mean that one should deliberately attend a N.O. to provoke humiliation. Yes, just go to the TLM. But if there is an occasion when ONE absolutely has to go to a N. O., there is the option of refraining from receiving, or if one chooses to receive, let it be kneeling and on the tongue. Francis, I'd have to disagree. As bad as communion in the hand is, theologically it is not an issue so long as it is treated with due reverence (which never happens in practice, especially in the rushed assembly line way Eucharists are handed out). What is an issue is the Priest facing the people during the Liturgy Of The Eucharist. It turns the Priest into a performer and as the Pope states in "The Spirit of the Liturgy", it turns the mass in on itself instead of towards God. If both issues were dealt with, the NO would be a lot more of traditional liturgy than it currently is. Thank you for sharing this information. Very helpful for one who has recently returned to receving Holy Communion on the tongue. What do you and your readers thnks of the eastern pratcive of intinction for either the EF or OF? And, what you make of it when the celebrant alone uses intinction for his own reception in the OF? Mgoog: on the Eastern practice of intinction. This is another solution to the problem of fragments and so on. The priest uses a spoon to place the Sacred Species in the mouths of the faithful. Done correctly the spoon does not touch the communicant's tongue. This practice has great value in the context of the Eastern liturgical traditon. It is a witness to the parallel concern they have with the Real Presence, and the response to it which has grown out of their historical and cultural circumstances. They should stick to their traditions, and we to ours. When people in the West talk about intinction, they are more likely to mean what I have seen in England: the communicant picking up a host, carrying it in the fingers to a chalice, and dipping it in before consuming it. The whole affair is... beyond words. It is contrary to our liturgical law, and to claim the precedent of the Eastern tradition for it is an insult to that tradition. self intinction is forbidden...intinction in the manner of the Maronites (who also use unleavened Hosts)...if this was mandated for the Roman Rite, it would automatically eliminate hand communion. In addition to Kazakastan, the Archdiocese of Colombo has banned Communion in the hand and other dioceses as well. We can pray the next Pope will ban CITH...since I don't think our current Pope (and may he have many years) will do it.